Kleefeld on Comics: Fummetti/Illustrated Comics? OK, how many of you remember Cool World? It was a 1992 movie by Ralph Bakshi that featured a mixture of live action and animated characters. It featured Gabriel Byrne, Brad Pitt and the voice of Kim Basinger. Like Who Framed Roger Rabbit? a few years earlier, it featured real people who were able to step into a cartoon world. However in light of it coming out just a few years after Roger Rabbit and bearing some superficial similarities, it really wasn't very good. But it had not only a comic book adaptation, but also a comic book sequel written by Michael Eury. I don't actually recall the storyline of the comic -- I know that, at the time, I could only find the first two issues -- but I do remember be disappointed in the art. Not that the illustrations by Stephen DeStefano and Chuck Fiala were bad, but the problem was that it was ALL illustrated. It was very difficult to tell which bits were supposed to take place in the real world and which were taking place in the cartoon world because everything had a black outline around it. There was actually ANOTHER comic that beat Cool World to the conceptual punch in that regard. 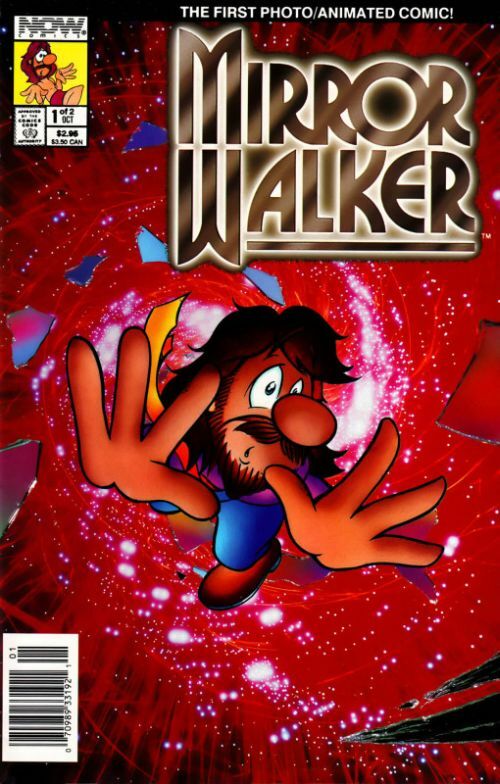 Mirror Walker featured a cartoon character that fell through a mirror, Alice in Wonderland style, into the real world. However, in this series, while the main character was drawn in an animated style, he was placed on photographs so it looked as if he were inhabiting a different world. The series only lasted two issues before it was canceled, so the story didn't get very far but, for the record, it was by Marv Wolfman and Barry Petersen. The question at hand, though, is: what other comics are out there that feature a deliberate mixing of illustrations and photography to show a distinction/difference between two worlds. Jack Kirby sometimes used photo collages in his comics, but they weren't intended to showcase a difference between two realities. (And don't you go bringing up his introduction of the Negative Zone to me! You know what I'm talking about here!) Where else have cartoons and real people interacted on the comic page, and shared their respective worlds with one another? Not too many I admit. The first S-hero example that came to mind was in the Elsewhere volume, World's Funniest where Mr. Mxyplkt and Bat-Mite fought each other through multiple universes through DC's history, including one where they briefly entered the "real" world and were horrified by the surroundings. I would've posted samples of that story if anybody was interested. Maybe now they will be. Also, you know those impressively illustrated Mangas where they capture the details of a towering overview of a city? Well, those are taken from ACTUAL photos of overhead scans and then later given greytones that match the Manga's artwork. A very effective shortcut that's no doubt made even easier with GoogleMaps. I'm actually working on a series of original graphic novels right now that use this effect.